What type of images sell? What do customers want? I would have to see your images to make a more informed personal comment. However, I think intuitively people respond to a great image, because on an emotional level it speaks to them and connects to them personally. They might not be able to explain why in a way the so-called “art critics” would, but they know when they like an image. I believe record shots, images without strong subjects, busy images with clutter, images that show too much, images that don’t have artistry and superior composition, and just plain poorly technically executed images, in the long run will not consistently sell. Generally, when you cropped an animal, bird, or person, you need to avoid cropping just a little so to avoid a subject that looks funny or strange without the rest of the body part. If you crop bold, then, the viewer assumes that the photographer wanted to show the subject in this way. Then, it wasn’t a mistake, or sloppy technique by the photographer. Also, there is a glut in wildlife portraits on the market nowadays; the new marketable trend is to shoot wildlife with wide-angle lenses, and show the animal in its habitat and with a grand scenic background. Wildlife portraits need to be stunning. Wildlife images need to show note worthy behavior, a rare species or less documented one helps too. Specializing, becoming a provider of certain imagery that few have is also more marketable. Story telling is a premium, a must, essential for high level commercial success. In regards to composition, center placed subjects can work; a round flower with the petals flowing outward like spokes of a wheel as an example. Although, generally off placed subjects, with rule of third principal, often are stronger and more dynamic. But there are no hard or fast rules regarding composition, photography isn’t an exact science; there is lots of subjectivity. What one person may like another won’t. This aspect of photography is what makes it so interesting. Everyone sees the world a little bit differently; visually it would be very tiring if this weren’t so. Content matters. Content and its visual arrangement is style. I believe that establishing a style is important. The goal should be mastering the craft and art of photography so your vision is discernible; your images recognizable. Yet, an artist is never satisfied: always growing and learning—improving. From the visual impact of image, the viewer can recognize the artist, the best photographers work is recognizable; Ansel Adams, David Muench, Elliot Porter come to mind—there are many, many more of course. From recognition comes success, although, I always thought that anyone who bought one of my images, no matter how big or small, took a little of me, my soul, and my heart with them along with my image. All the best following your passion, hopefully this message helps and inspires you. 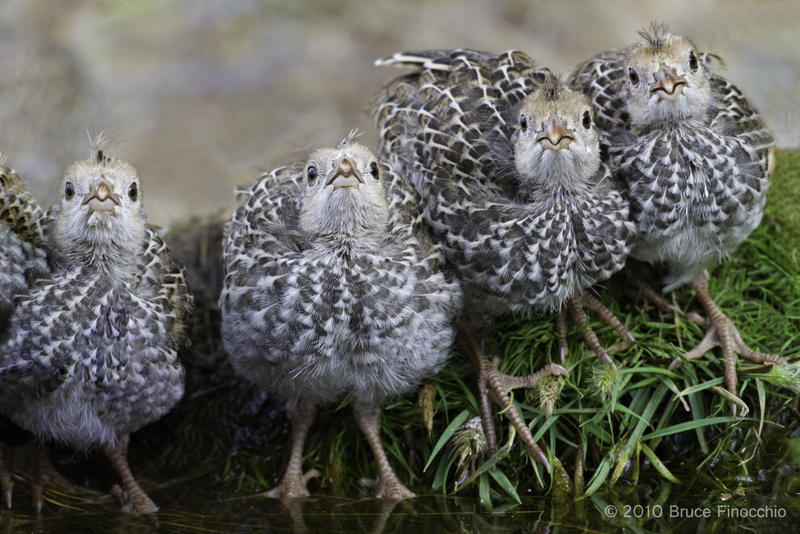 Here is a shot I have been trying to get for years, California quail chicks lined up at the edge of my ranch pond in soft diffused lighting I like so much. Very pictorial, with the help of some post-processing, showing some implied behavior and that cute factor that always endears us humans to babies. This image exemplifies my photographic style of getting in close, and a vision of showing nature and wildlife in an extraordinary manner–letting nature’s beauty shine, and its spirit show. Author Dream Catcher ImagesPosted on June 6, 2012 September 2, 2012 Categories Bird Photography, Business Of Photography, Visual CreativityTags Composition Questions, Content Matters, Developing Style, Images that Sell, Quail Chicks, Subjectivity, What Customer Want3 Comments on What type of images sell? What do customers want?